OMG MM!!!! A super huge ooohhh … aaaahhhhh for these. I’m a huge fan of acetate, and you’ve made it shine! All are gorgeous, but I’m blown away by the blue acetate/Tibetan bead ones. They are … wow! Love, love, love. Sooo pretty! I especially like the blue ones. i practically live in jeans and they would be perfect! awesome work! Great Designs! Love the colors of the acetate, especially the blue one and the way you have used them. Love ‘em all! 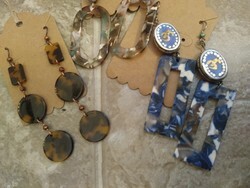 I’m going to have to get some of these great acetate pieces just to look at and enjoy all of the colors and patterns. The acetate pieces are so pretty it would be hard to go wrong with them. These are gorgeous! Very hip and I feel younger already! I’m in with those denim blues, too! All great designs. 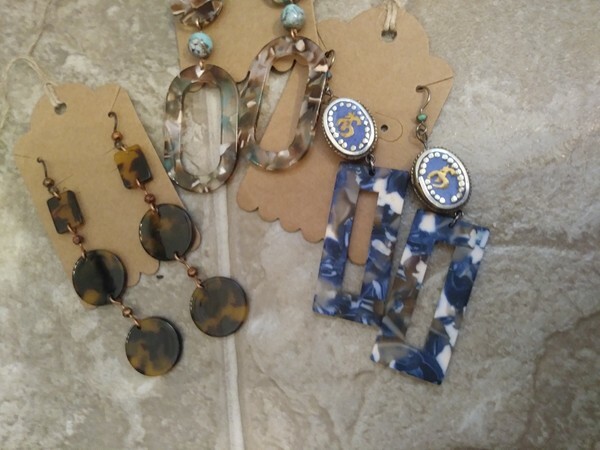 Wish I could see all of the middle earrings better, cuz I think they are my faves! But it’s hard to choose among the 3 pairs. More, please, MM! Can’t get enough of that cool acetate! I love acetate from LB! It was a good idea to pair the Tibetan beads with the acetate. Very original! I love it!